We already knew the Godzilla Cthulhu Sauron El Niño of 2015 was gonna be bad. But exactly how bad are we talking? According to the World Meteorological Organization, this year’s El Niño ranks among the three strongest of the past 70 years, and it may become the most powerful El Niño ever recorded. One sign that the 2015 El Niño is approaching epic proportions appeared over the past week, when meteorologists noted record-high sea surface temperatures across a swath of the central Pacific known as the Niño 3.4 region. This region, which stretches between 90 degrees west and 160 degrees east longitude, 5 degrees north and 5 degrees south of the equator, saw a weekly average temperature of 3ºC (5ºF) above normal—higher than the 2.8ºC anomaly recorded in 1997. Coincidentally, NOAA also released its monthly State of the Climate report today. Last month was not only the hottest October on record, it was the largest temperature departure for any month in the past 136 years of record-keeping. 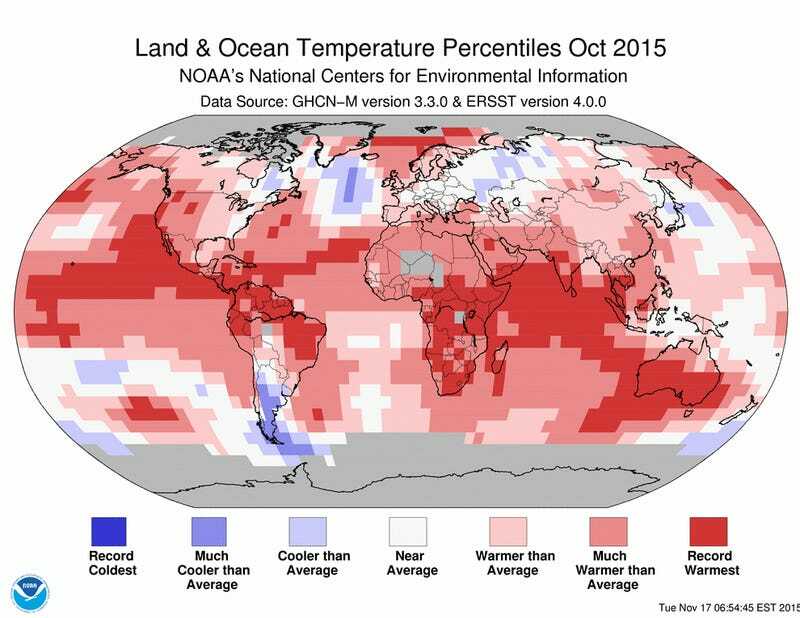 October was brutally hot, thanks to a nasty combination of El Niño conditions and global warming. 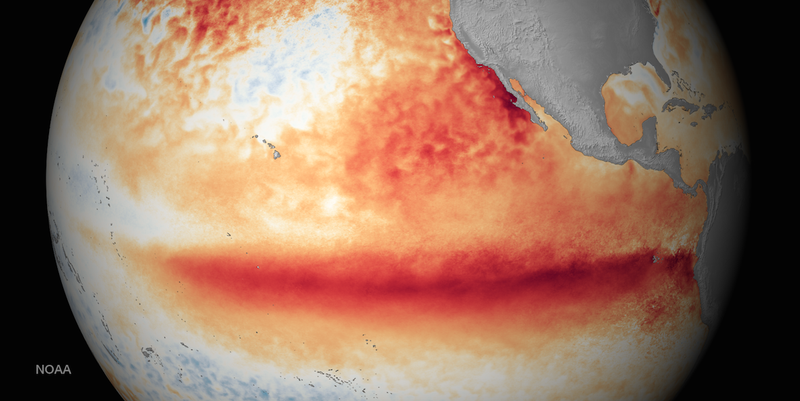 Already, the 2015 El Niño is having devastating impacts across the world. An El Niño-fueled drought in Southeast Asia is contributing to the disastrous wildfire season in Indonesia, which has caused more than 500,000 people to fall sick. El Niño conditions also incited a record-breaking tropical storm season in the North Pacific this year. Hurricane Patricia, which made landfall in Mexico on October 24th, was the most intense tropical cyclone ever recorded in the western Hemisphere. And let’s not forget how warm ocean waters are causing a mass die-off of Earth’s coral reefs worldwide. According to NOAA’s recent Winter Outlook, the entire continental US is in for a seriously wacky winter. El Niño is expected to bring bitter cold weather and lots of rain to the southern US. Meanwhile, an exceptionally warm, dry winter in the Pacific Northwest is expected to aggravate the region’s growing drought. This past summer, drought conditions fueled massive wildfires across Olympic National Forest. We’ll keep the updates coming as we learn more. In the meanwhile, it’s time to get prepared. When El Niño kicks into high gear in January, Californians can expect rainstorm after rainstorm, accompanied by plenty of mudslides, flooding, and all the other problems you might expect. So: Stock up on supplies. Buy a goddamn umbrella, and maybe some flood insurance. Most of all, stay vigilant, because things are about to get weird.